Lamborghini Charlotte is excited to offer this rare and classic 1984 Lamborghini Jalpa P350, with just over 18k miles. Chassis #: ZA9J00000ELA12127. Pictures, service history, and additional details available now. The Bertone-designed Lamborghini Jalpa was introduced at the 1981 Geneva Auto Show. It was released for worldwide sale as a 1982 model, joining the Countach. In keeping with company tradition, it was named after a breed of fighting bulls. The Jalpa succeeded the Lamborghini Silhouette and carried design DNA from the original Lamborghini Urraco, which was released from 1973. Powering the Jalpa was a mid-mounted aluminum V8 that was enlarged to 3.5-liters with a longer stroke than of the prior Silhouette. The engine offered 255 horsepower and 231 pounds-feet of torque. Induction was handled by a quartet of 40 DCNF twin-choke carburetors. Zero-to-sixty mph took just 7.3 seconds and top speed was achieved at 161 MPH. The suspension system was comprised of coil springs, MacPherson struts and anti-roll bars front and rear. They rode on 16 x 7.5-inch Campagnolo wheels mounted on 205/55VR16 tires up front and 225/50VR16 tires in the rear. Skidpad performance reached 0.846g. The supercar was fitted with many amenities including leather upholstery, air conditioning, an AM/FM cassette stereo audio system, power windows and a power driver's side mirror. In 1984, at the Geneva Show, Lamborghini introduced updates to the Jalpa which included a change from black plastic body parts to body-color pieces. The taillights were now circular in design. The Jalpa would become the company's most successful V-8 model to date. By the time production ended in July 1988, 416 Jalpas were sold. This particular example is finished in Rosso with a newly appointed Black interior. The odometer shows just 29,560 original kilometers, which translates into 18,147 miles. Please ask for details! Lamborghini Charlotte offers extremely competitive financing, nationwide delivery, and a down to earth buying process without equal. Call today and experience the difference. **While every possible effort is made to accurately describe our vehicles and their availability, we recommend that you please verify availability of your vehicle of interest before making the trip to see us. Thank you for choosing Lamborghini Charlotte! ** WHY CHOOSE US --- Lamborghini Charlotte represents the highest standard in the industry with a personal, genuine, and down to earth experience without equal. We offer extremely competitive and customized financing and leasing, nationwide delivery, and vehicle customization for those who desire. Inquire today and experience the difference. Please note that vehicle showings and test drives are offered by appointment only. We are open 9:00am-6:00pm Monday-Friday, Evenings and Weekend By Appointment Only. 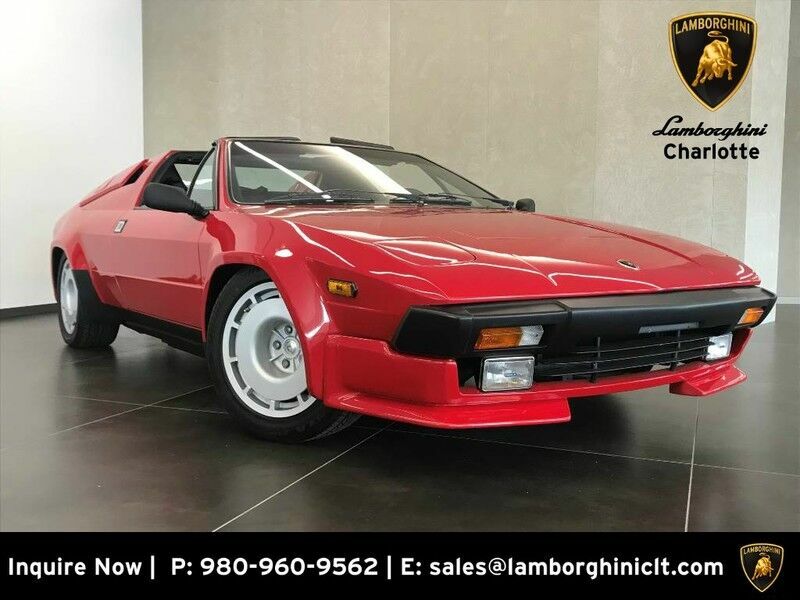 Lamborghini Charlotte is excited to offer this rare and classic 1984 Lamborghini Jalpa P350 with just over 18k miles. Chassis #: ZA9J00000ELA12127. Pictures service history and additional details coming soon.